The big news, so far, this week is that legendary MetroBulls defender Mike Petke (pictured above left) will call it a career at the end of this season. Petke, beloved by MetroBulls fans for his "Revenge Is Coming" antics (we'll even overlook those three seasons he spent with DC), had been relegated to the subs bench this season by the emergence of rookie Tim Ream and the re-emergence of Carlos Mendes. Hopefully the club offers him a front office or coaching staff position after he officially hangs up his boots. 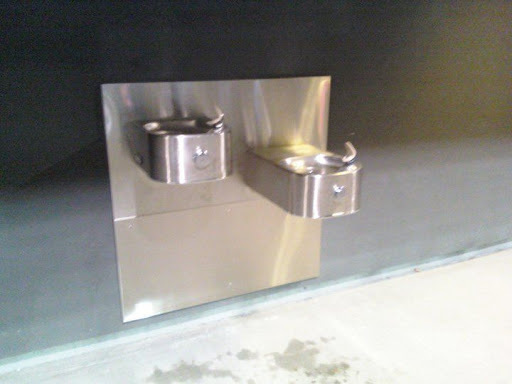 The second biggest piece of RBNY news this week is that (at least) a couple of water fountains have, apparently, been installed @Red Bull Arena. I was in shock when someone posted a photo album, with this picture, on the Hans Backe Viking Army facebook group, claiming that these were intalled by Gate D. I've yet to see for myself, but will confirm that this is actually the case on September 11th. You think I'm kidding when I say this is BIG? Well, you try standing in 95-100 degreee heat and then stand in line for 20 minutes to buy a $4 bottle of water, because no one installed water fountains. Yeah, I thought so! Dane Richard's magical goal against San Jose is up for goal of the week. Unfortunately, as of this writing, he's lagging behind Freddy Montero's and Jack McInerny's goals in the voting. Both of those were average goals, at best, so vote for Dane today and vote often. I do believe voting ends tomorrow @midnight. Sheanon Williams, a former US U17 & U20 NT player who was recently on trial with the Red Bulls, has signed with the Philadelphia Union. Red Bulls Head Coach Hans Backe was impressed with Williams' play for the Harrisburg City Islanders during the RBNY/Harrisburg US Open Cup game back in June. There is one RBNY away game date change of note. Yes, FC Dallas vs RBNY @Pizza Hut Park will now take place on Thursday Sept 16th, instead of Saturday September 18th. Why was this game rescheduled, you might ask? Well, because KISS needs FC Dallas' "Soccer Specific Stadium" for a concert on the 18th. Unbelievable right? Well, there's always Two Sides of The Coin to anything and everything. In this case, FC Dallas fans can go to the game on Thursday, then Rock N Roll All Night on Saturday, all for just $40.00. You can Shout It Out Loud Dallas fans! What a Deuce of a deal, eh. The Cathedral of Football, Red Bull Arena (built by Makita), will host an International friendly between the National Teams of Colombia and Ecuador on Friday, October 8th (8:30pm). Will Juan Pablo Angel get the call up for Colombia? Your guess is as good as mine. The US Soccer Federation (aka Sunil Gulati) has given USMNT Coach Bob Bradley a four year contract extension. Apparently, Bradley is not good enough for the vacant Aston Villa job, but he's good enough to guide the USMNT through the 2014 World Cup. Good luck Mr. Bradley, but, please, no more Jonathan Bornstein or Ricardo Clark. Thanks!